General George Washington ended British colonial rule in Boston with one audacious coup, and it happened on Dorchester Heights. The hilltop in South Boston now called Thomas Park is known to history as Dorchester Heights (map). During the night of March 4, 1776, Washington's troops and local volunteers moved 59 heavy cannons into place on the Heights, wrapping the cannon wheels with straw to muffle the sound of movement, and working in darkness so as not to be noticed by British sentries. Had the British garrison at Boston discovered Washington's maneuvers before the guns were in place, they could easily have crippled the American army and dealt a grievous setback to the revolutionary cause. The whole entreprise was fraught with peril and hardship. The cannons had been dragged 300 miles (483 km) from Fort Ticonderoga by 80 yoke of oxen in the dead of winter, over forest tracks. That they even made it to Boston was nearly a miracle, the accomplishment of General Henry Knox of Boston. The cannons were entrenched on Dorchester Heights by dawn, and the British garrison under General Howe awoke to find themselves well within range of this powerful American battery. Howe ordered his soldiers into boats for an amphibious attack, but a violent storm put an end to it before it started. That was it. A few days later General Howe, the garrison, and a thousand Loyalists evacuated the city and sailed for Nova Scotia. Each year Boston celebrates this "Evacuation Day" on...St Patrick's Day, allowing South Boston's Irish-American community to enjoy a religious holiday with a secular, patriotic rationale. The white marble Georgian revival tower atop the hill was commissioned in 1898. 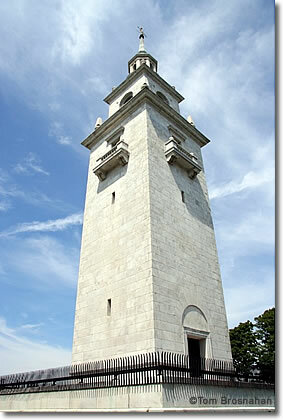 Dorchester Heights is now part of the Boston National Historical Park. in Thomas Park, South Boston MA.